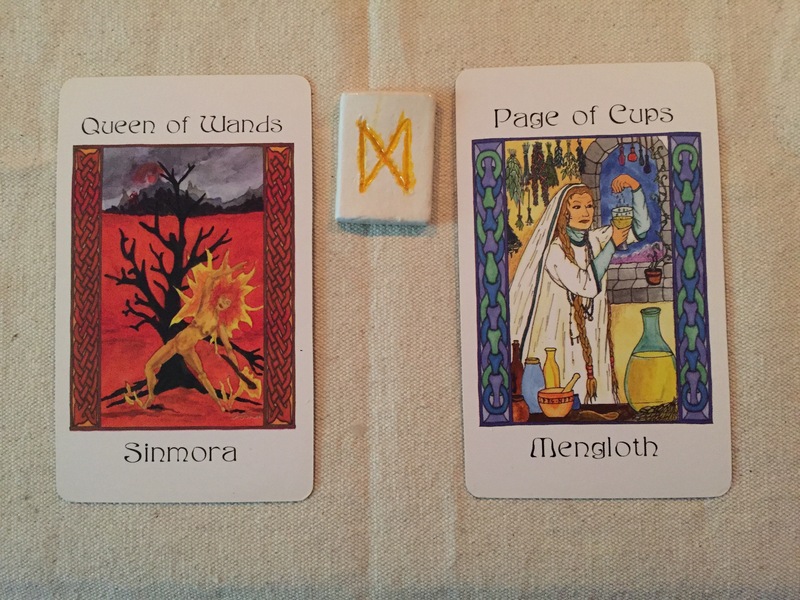 Today’s Draw: Sinmora/Queen of Wands; Dagaz; Mengloth/Page of Cups. Mengloth urges you to look at your self-care today. This has been coming up frequently of late, and from what I hear from those around me, it is an issue we’re all dealing with. If you are not in good health and a positive frame of mind, it’s difficult to do anything. So, once again, keep an eye on yourself and practice positive self-care. 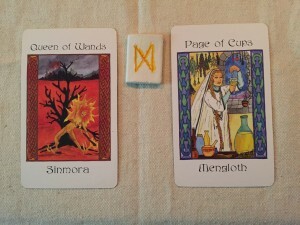 You need your energy, because Sinmora is calling you to dance a fiery dance of creation. She calls you to join Her, to dance from the core of your soul, to tap into your passions and to create a better life. A life in which you have time for what’s truly important, for the activities that feed your soul, the people who bring joy to your heart. Life is too short to be miserable, Sinmora reminds us. Cast all the unnecessary things into the fire, and join Her in the dance. Dagaz gives you the point of focus, the inflection point where those changes go from plan to reality. Filled with the light and heat of the sun, Dagaz brings you healing energy, and gives you the encouragement of your goals—in sight from your current vantage point—to keep going. Burn away the old, and dance around the flames.